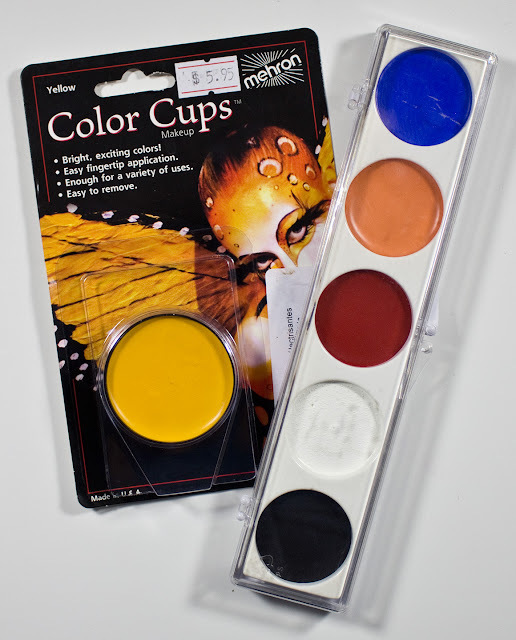 Mehron Color Cup in Yellow & Clown Makeup Palette in Black, Clown White, R/B Red, Auguste, and True Blue. 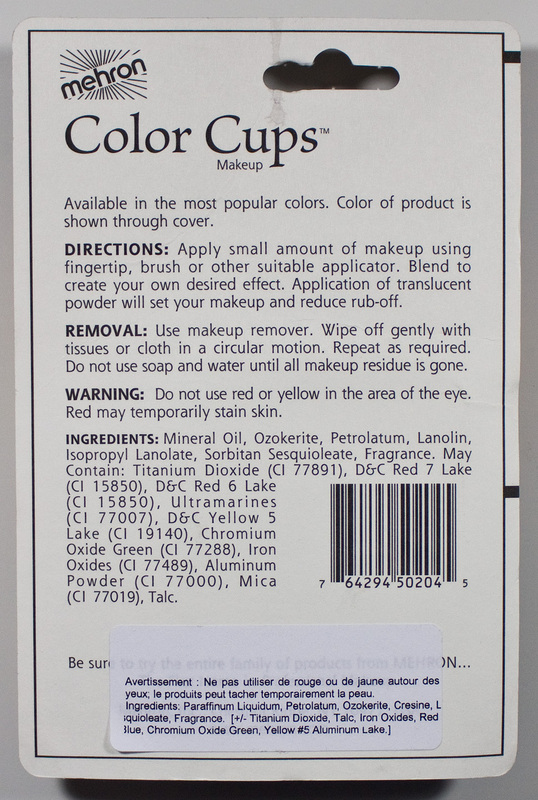 The Mehron Color Cup in Yellow retails for $6.50US for 0.42 oz (12 g) of product, I got this at a makeup store for $5.95CAN before the price increase this year. The Mehron Clown Makeup Palette retails for $11.50US for 1.25 oz (35 g) of product, I got this at a makeup store for $9.95CAN before the price increase this year. Both I purchased from a relatively close store call Kind of Magic in Waterloo. Mehron Color Cup in Yellow back. 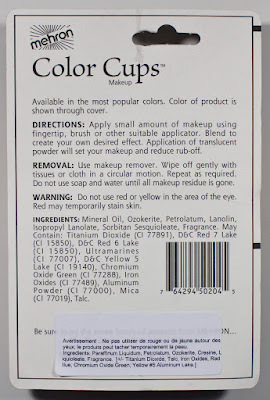 Mehron Color Cup in Yellow & Clown Makeup Palette in Black, Clown White, R/B Red, Auguste, and True Blue; Used. The Mehron Greasepaint formula is a creamy texture with excellent pigmentation. These formula of the Yellow, Black, R/B Red, Auguste, and True Blue are more like a traditional grease paint and emollient in texture. 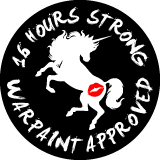 The shades of Black and R/B Red had the most slip to them and Black was the oiliest like texture out of all of them and a little too easy to move around on the skin. 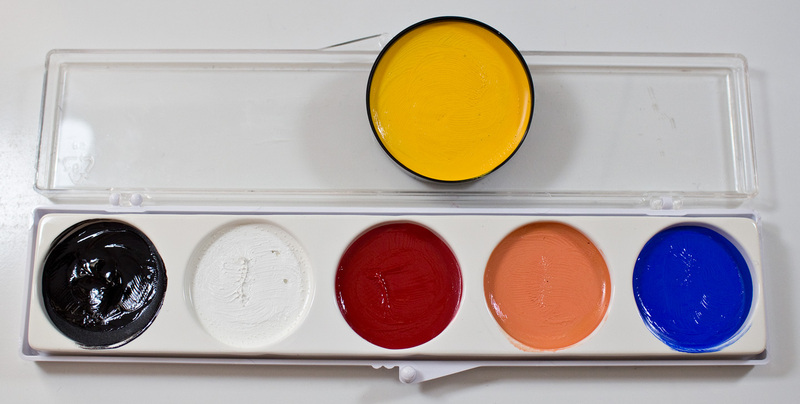 The Clown White shade in this palette is the staple Clown White you can purchase in a larger container. It is a VERY dense cream and super white on the skin. It's also dense than my Clown White Lite cream but also harder to manipulate than Clown White Lite as well. Which is a good thing if you doing clown makeup and need it to not move at all through a hot performance. All of these shades do need a powder to set the product on the skin. Compared to the MAKE UP FOR EVER Flash Color formula, I found that their range was in general a more dense feeling cream product with exception of the 2 shimmer shades. All the 10 solid colour shades were very consistent in texture in comparison to these Mehron Greasepaints. Yellow is a pure yellow with a cream matte colour finish. Black is a true black with a cream matte colour finish. 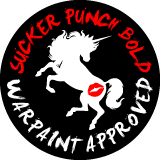 Clown White is a pure white with a cream matte colour finish. R/B Red is a warm true red with a cream matte colour finish. Auguste is a light peach-orange with a cream matte colour finish. True Blue is a pure blue with a cream matte colour finish. Wear: I got 15+ hour in this during the summer heat and humidity so long as you set these with a powder but all cream makeup needs to be set with a powder so I don't consider this altering the wear time. Packaging: Is a clear lid jar and palette. 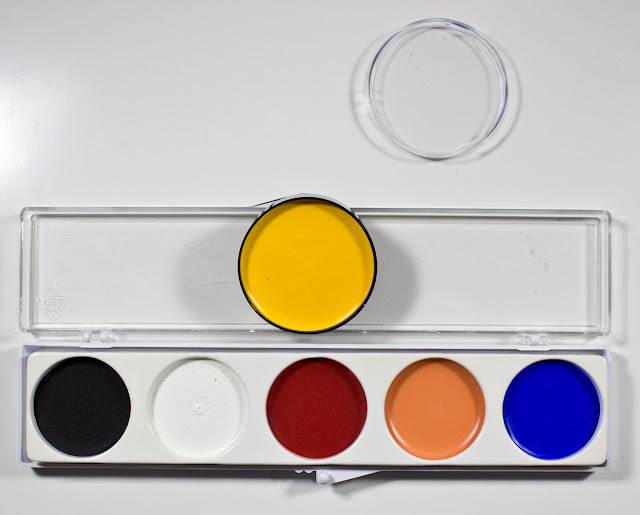 Daylight swatches: Mehron Color Cup in Yellow & Clown Makeup Palette in Black, Clown White, R/B Red, Auguste, and True Blue. 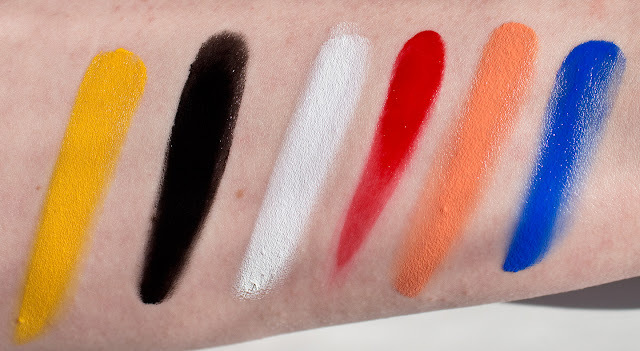 Flash swatches: Mehron Color Cup in Yellow & Clown Makeup Palette in Black, Clown White, R/B Red, Auguste, and True Blue.